In-store events are subject to change. Please check with each store to confirm the event schedule. Fine Art and Fashion from an artists’ point of view. Also featuring handmade art jewelry by numerous award winning jewelry artists, with a special incentive offered during Fashion Week El Paseo. STORE HOURS: M-Sat 9 a.m. – 6 p.m.
20% Off Your First Service! Mention “Fashion Week El Paseo” when booking any service, and enjoy 20% off your first service! STORE HOURS: M-F 9 a.m. – 7 p.m.; Sat 8 a.m. – 7 p.m.
Come visit us in salon to pick up a complete schedule of daily events including trunk shows, demonstrations + more! STORE HOURS: M-Sat 10 a.m. – 6 p.m.; Sun 11 a.m. – 5 p.m. EVENT HOURS: M‒Sun 12 p.m. ‒5p.m. Receive complimentary $20 gift card (no purchase necessary). Yoshi Yoshi 100% made in Japan. Exceptional artistic knits. Viviana Uchitel Collection-Argentina. Unique dyeing techniques. The Evolution of Newness Continues! Mela Purdie Sydney, Australia. Clothes that travel with you. MAC Jeans – USA-Germany. For successful people! KOMAROV – Sportswear and dresses. Ideal travel companion, pleated and hand printed! STORE AND EVENT HOURS: 10 a.m. – 6 p.m. Customized makeup consultations, customized skincare consultations, and custom samples. STORE HOURS: 9:30 a.m. – 6:30 p.m.
TRUNK SHOW HOURS: 10 a.m. – 3 p.m.
We will have trunk shows everyday! 10 a.m. – 3 p.m. with special promotions. On Sunday, March 17, 10% of proceeds will go to Loving All Animals. Sue Elle, renowned painter of koi and related Asian themes, will display her recent works and discuss painting techniques being used in current projects. We’ve moved! Visit our new location between Williams Sonoma and Sephora. STORE & EVENT HOURS: 10 a.m.-7 p.m.
Shop five essential shapes in one beloved fabric, washable stretch crepe, a best-selling textural knit that’s made exclusively for us. Earn double rewards points on your entire purchase. *Cannot be combined with any other offer. Some exclusions apply; see store for details. STORE HOURS: 9 a.m. – 10 p.m. EVENT HOURS: 3:30 p.m. – 5 p.m.
Elena Bulatova Fine Art is delighted to partner with Make-A-Wish Orange County and the Inland Empire to host a reception celebrating the joy of art and the hope of a wish. Light refreshments and beverages will be served. Margaret Rowe Trunk Show, 11 a.m. – 3 p.m.
Meet our design team Kelly & Marie Gray with Maria Lopez, Fashion Presentation Runway to Reality, 11 a.m. Fashion Sketch Artist Renee Reeser, 12 p.m.‒4 p.m.
Entertainment by Vocalist Ginnine Francis, 4 p.m.‒7 p.m.
Spring/Summer Trunk Show 2019, 11 a.m. – 5 p.m.
STORE HOURS: M-Sat 10 a.m. – 7 p.m.; Sun 11 a.m. – 5 p.m. EVENT HOURS: Monday, March 19: 10 a.m. – 7 p.m.
All day, Monday, March 19, offering a 20% discount on all purchases and enter to win a $500 gift card. During Fashion Week El Paseo, enjoy 25% off all injectables. Call to book your appointment today: 760-341-1300. Mention this ad to receive your discount! TRUNK SHOW HOURS: 1 p.m. – 5 p.m.
TRUNK SHOW HOURS: 11 a.m. – 5 p.m.
Trunk show and refreshments, Tuesday, March 19 and Saturday, March 23. Let SEPHORA get you “Runway Ready” for Fashion Week! Book your Custom Makeover and receive a gift bag with purchase of $75 or more. Spaces are limited, call for your reservation, 760-837-1970, ext. 3. STORE HOURS: M‒Sat 8:30 a.m.-6 p.m.
Shop in our salon Tuesday through Saturday and be entered into a raffle drawing to WIN Salon Products. Also, with any product purchases, Sherry Mesa The Salon will contribute 10% of all sales to the Safe House. We will be applying and giving fashion hair extensions to those interested. Receive 20% off your first time purchase of extensions. With any product purchased, you will be entered into the raffle drawing. Understand hair care products and why we use them. Complimentary hair care samples. Complimentary consultations and hair care samples from SMTS’ professional stylists. Mention this at your appointment or stop by the salon Friday and receive a gift from us. We’ll have fresh spa water and healthy treats available. Complementary hair care samples. EVENT HOURS: 4 p.m. – 7 p.m.
After the Runway Trunk Show! 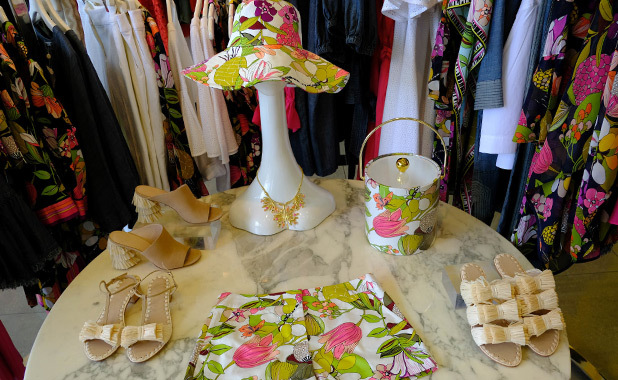 Come visit us for lite bites and refreshments while you see up close our new Spring/Summer designs. MIX & MINGLE MARCH 18: 5 p.m. – 7 p.m.
Terra Lane Hair Design invites you to experience the premiere beauty destination on El Paseo. In celebration of Fashion Week El Paseo, we will be hosting a mix & mingle on Monday, March 18, which will include Champagne and hors d’oeuvres, as well as the chance to win services or products by entering our raffle. STORE HOURS: 10 a.m. – 10 p.m.
IN-STORE EVENT HOURS: 5 p.m. – 7 p.m. Enjoy complimentary sips & bites while you shop! STORE HOURS: 10 a.m. – 5:30 p.m.
IN-STORE EVENT HOURS: 10 a.m. – 4:30 p.m.
In-store event highlighting David Cline – (the soft shaped shirt) – and Pure Amici (sportswear). Extra stock available for immediate purchase! STORE HOURS: M-Sat: 10 a.m. ‒ 5 p.m.; Sun: 11 a.m.‒5 p.m.
IN-STORE EVENT HOURS: 11 a.m. ‒ 3 p.m.
Vince invites you to Discover Spring 2019, Tuesday, March 19, 11 a.m. – 3 p.m.. Champagne will be served. RSVP to Brittany Leger, Bleger@vince.com. Exclusions may apply.